28. May 1999. Izdaje NIP „GLAS“ a.d.
Due to difficulties caused by overnight NATO bombing of the Serbian electric power grid, Glas Javnosti news reports on Internet may be somewhat delayed. We shall appreciate your understanding. BELGRADE - Several powerful detonations were heard in Novi Belgrade, on Thursday evening, around 8.40 p.m. According to inhabitants of that part of Belgrade, a dense smoke was seen from the direction of highway. 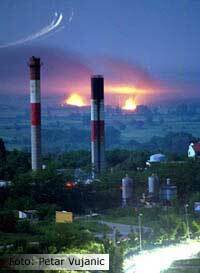 Only several minutes before those detonations, much of Belgrade was plunged into darkness. PRISTINA - Four powerful detonations were heard in downtown Pristina, on Thursday, around 5.10 p.m. Immediately after the detonations were heard, a dense, black cloud of smoke was seen southwestern from the downtown Pristina. BELGRADE - The President of FRY Slobodan Milosevic said on Thursday that political solution of Kosovo crises demands the stoppage of NATO's aggression on Yugoslavia, and giving essential role to UN in that process. On meeting with former Greece Prime Minister Constantine Mitsotakis, who arrived in friendly visit to FRY, Milosevic said that Yugoslavia "obstinately and consistently pleads for peace". "Yugoslavia wants peace which means an early solution of problems should be transferred from the military to the political sphere", Milosevic said. He underlined that Yugoslavia tries to solve a number of humanitarian problems, caused by NATO's bombing. "There are no other obstructions for returning of refugees to their homes in Kosovo, besides bombing, because military actions in that regions were finished when terrorist KLA was beaten", the President of FRY said. According to Belgrade's media, Mitsotakis expressed "his own support to Milosevic in efforts to find peaceful, political solution of Kosovo crises". PARIS - One French unmanned aircraft disappeared on Wednesday over Kosovo, and "it is undoubtedly downed", the French Army Headquarters Colonel Anre Pelicai said on Thursday. "It was the third French unmanned aircraft which French forces lost in Kosovo", Pelicai said a press conference. BELGRADE - Russian Foreign Ministry branded the indictment of Milosevic and his henchmen as "politically motivated" and said the move would complicate the peace process. "We intend to continue our efforts to find political solution for Yugoslav conflict, including participation of the President Milosevic", it is stated. French Interior Minister Jean-Pierre Chevement made distant from the French government`s position, and said that he does not agree with Tribunal's decision. "I do not approve of this initiative," said Chevement. "I think it does not serve the interests of peace. If you proclaim your opponent for criminal, there are no conditions for political negotiation", he added. British Foreign Minister Robin Cook said that "there can not be agreement or amnesty for war crimes". "Indictment is one more reason for Yugoslav people to disclaim Milosevic and his wrong policy", Cook said. The Spokesman of the Greece Government Dimitris Reppas said that indictment is wrong move, which will complicate the Kosovo crises. "On one side, Milosevic is called on negotiations with international community about peaceful solution, and, on another, he is threatened by arresting", Reppas added. The UN special representative for Kosovo Edward Kukan concluded that indictment will probably, complicate efforts for peaceful solution of Kosovo crises. "We are worried about possible influence which this indictment would have on political solution of Kosovo crises", the spokesman of Chinese Foreign Ministry Ju Bangcao said. OSCE Chairman and Norway Foreign Minister Knut Vollebaek said that war crimes tribunal must be independent and "politically blind". NATO Spokesman Jamie Shea said that indictment will not change anything and that NATO alliance will continue air strikes on Yugoslavia and insist the authorities in Belgrade to accept NATO's five conditions. The Spokesman of the US State Department James Rubin said that Washington supports Tribunal's decision and that there can not be any amnesty, which should help political negotiations. "However, we do not expel further contact with the President Milosevic, if it will help realization of our aims", Rubin added. LEBANE - Two persons were killed and two wounded when Cekavicki bridge over Jablanica river in Lebane municipality was attacked on Thursday. The bridge was hit by three missiles at 1.25 p.m. destroying it completely, while one missile downed into river. At the moment of the attack, wounded persons were near the bridge. There were no military facilities in the vicinity of the bridge. NATO warplanes also fired eight missiles into the Leskovac suburb of Donje Sinkovce and the Arap valley, at 1.18 p.m.
BELGRADE - Serbia's Minister Without Portfolio Goran Matic said that accusing of the highest Yugoslav officials is "propaganda trick which should delay political solution and diplomatic efforts" for solving of Kosovo crises. The Hague tribunal is private court of Madeline Albright, James Rubin and Wesley Clark for all those who are not their sympathizers. Serbian Deputy Prime Minister and leader of the Serbian Radical Party Vojislav Seselj concluded that America used the indictment to prevent Yugoslav President Slobodan Milosevic from participating in the peace process. "The U.S. is trying to make the negotiations more difficult and to block all Russian initiatives", said Seselj. The Spokesman for Socialist Party of Serbia Ivica Dacic concluded that the indictment is "in function of genocide on Serbian people and state". "That show of the NATO criminals express all their hypocrisy and that act should close the public eyes in the countries which are NATO's members, to cover the genocide on Serbian people", Dacic said a press conference. The head of the Civil Alliance of Serbia Goran Svilanovic said that the tribunal's decision would not help the peace process. BELGRADE - Biljana Momcilovic, a 29-year old woman, and two children, Dejana (5) and Stefan Pavlovic (8), were killed when NATO missiles hit the houses in the village of Ralja near Sopot, south of Belgrade, on Wednesday night at about 11:15 p.m. Parents of the killed children, Branislava and Vladimir Pavlovic, who suffered serious injuries, as well as another badly wounded woman, Ljubinka Ivanovic, were all taken to the Emergency Medical Help Center in Belgrade. Around the same time, NATO planes also launched attacks on Makis and Ostruznica on the outskirts of the Yugoslav capital, as well as the area of Bubanj Potok. A total of 53 missiles rained down on Belgrade and the wider metropolitan area in overnight strikes. Early on Thursday, at about 2:00 a.m., a missile struck the building shared by the Jugoimport company and the Yugoslav Federal Directorate for Supplies and Procurement in New Belgrade. The missile, however, failed to explode. Serbian security forces blocked all accesses to the building in Bulevar Umetnosti Street, just 100 meters from the Chinese embassy NATO blasted on May 7. Early on Thursday, several powerful detonations also sounded from the direction of the outer Belgrade suburbs of Batajnica. Witnesses reported that as many as 18 extremely powerful blasts reverberated from that direction. UZICE - Early on Thursday, at 11:55 a.m., NATO planes hit by four missiles a TV and postal relay facility on the hill of Zabucje near Uzice. CUPRIJA - On Thursday morning, from 9:25 till 9:40 a.m., more than 10 missiles struck the Dobricevo agricultural farm complex, about four kilometers from Cuprija. NIS - On Thursday, at 1:45 p.m., NATO warplanes again zeroed in on the industrial zone in northwestern Nis. A dozen extremely destructive detonations rocked the entire city as well as its surroundings. At about 3.00 p.m., enemy warplanes repeatedly pounded the same parts of Nis. KURSUMLIJA - Early on Thursday, in its fiercest attack on Kursumlija up to now, NATO planes zeroed in on the Markovici residential area on the outskirts of the town. The raids lasted from 1.00 to 4:00 a.m. and about 30 missiles were fired in the space of these three hours. According to early reports, there were no casualties from the attacks. KRALJEVO - Early on Thursday, at 2:20 a.m., a missile hit the village of Vranesi, about 15 kilometers from Kraljevo. Fortunately, the missile landed in a nearby field, failing to explode and cause material damage. ZRENJANIN - As NATO warplanes were flying over the area of Zrenjanin early on Thursday, at about 2:00 a.m., a missile landed near the railway station in the village of Lukicevo. The missile failed to explode, but the railway line was damaged, causing the severance of railway traffic from Zrenjanin to Pancevo. VALJEVO - Late on Wednesday, at 11:18 p.m., a missile fell in the field owned by farmer Toma Simic in the village of Rabas, about 10 kilometers from Valjevo. About ten minutes earlier, two missiles were fired at Mt. Maljen and the wider area of Mt. Divcibare. Their powerful detonations were heard even in Valjevo, which is over 30 kilometers away. BRUSSELS - In the last 24 hours, NATO aircraft have carried out a total of 741 sorties, setting a new record since air strikes against Yugoslavia began on March 24, a Western Alliance statement said on Thursday. PRISTINA - Three persons were killed and two wounded in NATO bombing of the villages of Djelekare and Gornja Budriga in the Kosovska Vitina municipality. NATO planes hit by two missiles these villages late on Wednesday, around 10:45 p.m. Material damage has not been established yet. Early on Thursday, 15 minutes after midnight, a missile struck the area around the village of Bitinje in the Strpce municipality. On Thursday, around 9:50 a.m., NATO warplanes repeated their strikes on the area around Pristina. Two missiles struck a Grmija trade company warehouse in Lebane. There were no casualties from the attack, but the strike inflicted huge material damage. Shortly after 9:30 a.m., two missiles struck the villages of Veric and Tucep in the municipality of Istok. BOR - On Thursday, around 9:30 a.m., NATO warplanes bombed facilities in Bor for the seventh time since the aggression began more than two months ago. During a 30-minute attack, about ten powerful detonations rang out. The target was a Jugopetrol fuel depot on the Zlatinski road, facility that had been completely destroyed in previous strikes. THE HAGUE - International Tribunal For War Crimes in the former Yugoslavia Chief Prosecutor Louise Arbour said on Thursday that she had indicted Yugoslav President Slobodan Milosevic, Serbian President Milan Milutinovic, Yugoslav federal Deputy Prime Minister Nikola Sainovic, Serbian Interior Minister Vlajko Stojiljkovic and Yugoslav armed forces Chief of Staff General Dragoljub Ojdanic. "There is a credible basis to believe thees accused are criminally responsible for the deportation of 740,000 Kosovo Albanians and murder of over 340 identified Kosovo Albanians," Arbour told a news conference broadcast live by CNN network. Arbour added that international arrests warrants had been issued against all five accused and appealed to them to "surrender voluntarily" to the Tribunal. In first diplomatic reactions, Trubunal's decision to hand over the indictment against a sitting head of a state during the endgame of peace negotiations on Kosovo has been described as a political move aimed at hindering the peace process. BELGRADE - Russia's special Balkans envoy Viktor Chernomyrdin, who was scheduled to travel to Belgrade on Thursday, postponed his visit until early Friday, Russian official Itar-Tas news agency reported, citing diplomatic sources. The decision, as reported, was made after Chernomyrdin spoke by telephone with Russian President Boris Yeltsin. Russian envoy's plane is expected to land at the Belgrade airport of Surcin on Friday, at about 10:00 a.m.
BBC 1 radio reported that Chernomyrdin had postponed his visit to Belgrade scheduled for Thursday to discuss with negotiators in Moscow a new development concerning the Hague-based War Crimes Tribunal indictment against Yugoslav President Slobodan Milosevic. Official Moscow said the indictment was a major blow to the efforts to solve the problem by diplomatic means. WASHINGTON - On Wednesday, US Senate voted 77:21 against a measure that would limit US military operations in Kosovo unless the Congress endorsed them. Three weeks after rejecting a proposal that would allow US President Bill Clinton to use ground troops as part of NATO air campaign against Yugoslavia, the Senate turned down another resolution banning appropriation of funds for offensive or peacekeeping forces in Yugoslavia after October 1, 1999, unless US Congress endorsed it. BONN - Officials from Western nations and specialized international financial institutions opened in Bonn on Wednesday a day-long discussion of making a kind of a Marshall Plan for the reconstruction of southeastern Europe once the Kosovo conflict was over. German Foreign Minister Joschka Fischer called on representatives from about 30 participating nations and international organizations to work on an "ambitious project" for promoting democracy and economic development in the Balkans once NATO air strikes against Yugoslavia were suspended, Reuters news agency reported. "We must stop this absurdity in which it is easier to raise money for war than peace," Fischer said. Aside from the EU nations, representatives of NATO, OSCE, OECD, EBRD, WEU, European Investment Bank, World Bank, IMF, Japan and Canada participated in the Bonn meeting. SMOLENSK - In the Film Festival of Orthodox Slav Nations in Smolensk, Nikita Mikhalkov's new movie "Siberian Barber", which opened the festival in Cannes, had no screenings. "This festival does not try to imitate any other similar event. There is no wealth, no international stars in it, and that is why I like it. If at a festival you can see what people are shooting and thinking, and the prize goes to someone who can rightfully call himself an artist, then it is more than enough. I am talking about the festival, not about lingering around. Russian festivals tend to look like European ones. They borrow a red carpet from a local party branch and then they all walk down it as if they were in Cannes. We can be interesting to the world only if we take our own way, if we follow our own traditions… I suppose it is more interesting and more natural to watch a movie dealing with Russia and shot in Russia than dealing with Hollywood," director Mikhalkov told our newspaper. "I don't care for what the critics say. The most important things in life are creed, health, love and a clear conscience. All other things are irrelevant. I know that I have made this film neither for money nor glory, nor to please anyone. I am completely satisfied to see children aged between 14 to 16 go to the cinema to see my film several times. In Russia, "Siberian Barber" attracted larger audiences than "Titanic", while in France it has been on in 360 theaters, attracting two and a half more watchers than the French film that was simultaneously put on the program. Those who understand nothing say that I have made a movie for foreigners. I reply: It is true. I did make a film for foreigners. But for 100 million foreigners who have been living in my country. For all those who don't know much about their adopted country, who are not familiar with its history and culture. You know the way it is in Russia. People go to the cinema to see the movies that are reprimanded and challenged. If the way you see a film and what you find in it is anything to go by, you can conclude what kind of man you are. "We deeply regret your Government's lack of sensitivity to the need of the Polish citizens for learning first-hand how people - who have been bombed for the last 60 days and demonized by those who are not interested even in the well-being of one side at the expense of the other one, as they would like to present it, but in deciding the fate of all others - spend their time," says, inter alia, the letter written to organizers of the Short Film Festival in Krakow by Yugoslav directors who were denied both Polish visas and an opportunity of attending the event where their movies had been shown. Slobodan Zujovic and Andrija Maricic, "undesirable" authors of desired movies, said that the festival organizers had done their best to make it possible for them to travel to Poland, but the Polish embassy in Budapest had remained merciless. "I felt as if I were outside a Kafkaesque castle as I was standing in front of the embassy building and talking to some voice coming from the home speakerphone," says Zujovic. "At long last, the Polish Ambassador expressed his regrets to our team by phone, saying we were ineligible for visas due to the categorical ban by the Polish Government and its Minister of Culture." The most important thing, however, is that their movies, made in Fix Focus production, were screened at the festival and that the audience strongly objected to the decision which deprived them of an opportunity of meeting the authors. Dream Team is gradually getting its final shape. White eagles, scattered all over the world, are flying to the Salonika nest, where Yugoslav basketball national team has been undergoing the second stage of preparations for the European basketball "fair" due in France. On Thursday afternoon, Dejan Bodiroga and Dragan Tarlac, who took part in the Greek championship play-off final, arrived finally in Salonika. "I am sort of tired because the Greek Championship closed only five or six days ago. I have had no time to pick up strength. I feel as if I were dragging my legs, but I am highly motivated. Dragan and I are going to work under the special program, gradually increasing the burden of training exercises, " Dejan Bodiroga told Glas Javnosti by telephone. In the last few weeks, there has been much talk about your joining the NBA league, namely the Serb community of Sacramento. Rumors about your transfer to Kinder have also circulated. Are you going to leave Athens? "Up to now I have no ready-made solutions. My joining the NBA league is likely, but some other interesting offers from Europe are on the table, too. I have a contract with Panatinaikos and I am closer to staying in Athens at the moment. We'll see," European number one basketball player in the past year replies mysteriously. What are our basketball national team's ambitions? "Undoubtedly, we are the favorites. If the complete team entered the field, I don't see who could beat us. However, we are talking about sports, where quality has to be proved in the arena. The championship lasts long enough and all teams will seek to play tough and prove themselves just in games against us," Bodiroga warns.